White Motor Corp. introduced the Oliver Plant/Aire 5400 Series planter, that had a seed meter that used air pressure to hold each seed in a cell against a vertical seed disc. This design originated the ability to singulate seed. The White model 3405 was a three-point mounted Plant/Aire planter manufactured in the mid-70s as the Oliver 5400 Series transitioned to the White 5100 Series. The 3400 planters had the same features as the 5400 and were available in rigid or flexible toolbar units. The roots of White Planters run deep in American agricultural history, reaching back 170 years ago. Today, those deep roots continue with the White Planters line that is now owned by AGCO. The legacy of White Planters can be found on farms across the world growing crops such as corn, soybeans, cotton, sugar beets, peanuts, snap beans, edible beans, peas, lentils and canola. In 1960, the White Motor Co. acquired Oliver Corp., foreseeing the potential for profit in agriculture, according to Draper. 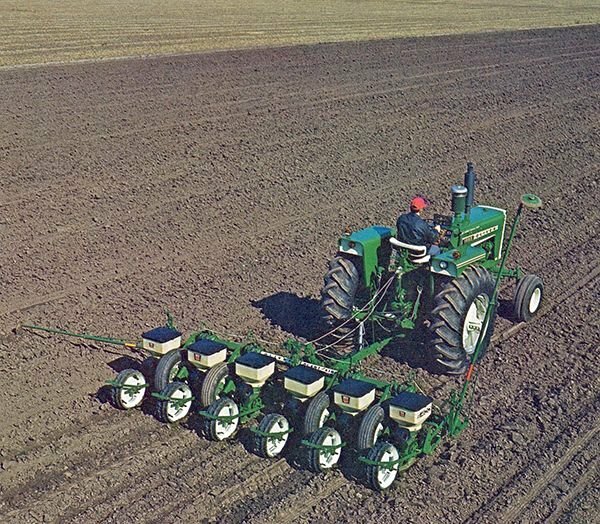 “In 1974, White introduced the Oliver Plant/Aire 5400 Series planter that had a seed meter that used air pressure to hold each seed in a cell against a vertical seed disc,” Draper said. “A cutoff dropped the seed into the seed tube and gravity moved the seed to the row. This design originated the ability to singulate seed (ensuring only a single seed is picked up and fed to the planter), so seed spacing and plant population per acre could be established. It was the Oliver 5400 Series that established White Planters’ “Simply Accurate” reputation and market position, due to its pinpoint accuracy of seed spacing within the row. Then, with the downturn of the global ag economy in the late 1970s and ‘80s, various components of the White Farm Equipment line went through several ownership changes, Draper said. “White Motor Corporation sold the White Farm Equipment Company factories in the United States to TIC Investment Corporation in 1980,” he explained. “Planters were sold through White Farm Equipment dealers. In 1983, Allied Products Corp. bought White Farm Equipment’s operations in the U.S. and reclaimed White operations in Canada, Draper went on to explain. Most recently, in 2018, White Planters introduced model WP9924VE, a large-frame planter on factory-installed tracks. This 24-row, 30-inch planter has a 150-bushel central-fill system that allows planting of approximately 300 acres before a refill is needed and includes several other features, he noted. “The WP9222VE wing-fold planter was also introduced in 2018 for the best in seed placement accuracy to no-till planting,” he said. The future for White Planters will continue to grow with increased innovation. This innovation has only expanded since AGCO acquired Precision Planting in 2017. “Since 2015, AGCO has been incorporating Precision Planting technologies onto the White Planters line to help producers improve planting accuracy, as well as optimize seedling emergence and stand establishment,” he said. “Precision Planting develops software, hardware and retro-fit production equipment to help farmers plant, harvest and analyze data from each field to improve yield and productivity. Kerry Hoffschneider can be reached at kerry.hoffschneider@midwestmessenger.com. Martin H. Richenhagen is chairman, president and chief executive officer. AGCO is a global leader in the design, manufacture and distribution of agricultural equipment solutions and delivers high-tech products for farmers feeding the world. In North America, AGCO products are sold through four core brands: Challenger, Fendt, GSI and Massey Ferguson as well as supported by Fuse smart farming solutions. Other brands marketed in North America include Hesston by Massey Ferguson hay harvesting equipment; Sunflower seeding and tillage implements; Gleaner combine harvesters; and White Planters, equipped with technology from Precision Planting. AGCO markets a full line of tractors, combine harvesters, hay and forage equipment, seeding and tillage implements, grain storage and protein production systems as well as replacement parts. AGCO had net sales of $9.4 billion in 2018. Fendt, GSI, Hesston by Massey Ferguson, Massey Ferguson, Fuse, Sunflower and Gleaner are registered trademarks and White Planters is a trademark of AGCO. Challenger is a trademark of Caterpillar Inc., used under license by AGCO. Precision Planting, vSet, vDrive, DeltaForce and 20|20 are registered trademarks and SmartFirmer is a trademark of Precision Planting LLC.